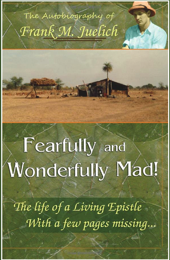 Fearfully and Wonderfully Mad! is a most inspiring, challenging and, at times, shocking autobiographical account of Frank Juelich. This is a deeply moving story of a man who is sold out to his Father God, whose aspirations are to be His friend and, as Frank puts it, “to help as many kids as my courage permits me to help” (p. 8). Frank has spent 40 years in India, including 37 years of ministry. He was instrumental in building homes, schools and computer labs for more than 500 girls and 1,200 boys who were disenfranchised orphans or from impoverished families. Frank is a Christian humanitarian missionary, a Bible translator, an adventurer, a visionary and, as Jesus was in His childhood days on earth, Frank is a carpenter by profession. The paperback edition is available from www.amazon.com for $14.50 plus shipping. The e-book edition is available from the Amazon Kindle Store for $9.50. The Kindle app is free to download on your iPad or iPhone. Paperback copies can also be ordered from Errol and Myrna Desouza (email: erroldesouza@gmail.com or phone: 604-859-8083). Laurie (Laurence) Van Kleek is a librarian/administrator at Summit Pacific College in Abbotsford, BC.